Discover isn’t just a new feature for the ephemeral messaging app, which has an estimate of more than 100 million active users. It’s a dramatic shift in product vision, one that suggests Snapchat is moving on from chatting. It’s not abolishing private photo sharing — the image screen is still the first thing you see when you open it — but it’s now parlaying people’s engagement with the app into more revenue-friendly features. It’s far easier to stick an ad in front of a Food Network clip than it is to stick one in front of personal messages from a friend. Unlike Snapchat’s messaging competitors like China’s WeChat or Canada’s Kik, the brand content in the Discover tab doesn’t come in the form of messaging at all. Instead, it’s a self-serve broadcast format. It’s staunchly a media product, not a communication one. Brands can still chat with users in the messaging part of the app, but it’s not a cornerstone of the Discover ad cash cow. Since Snapchat is the leader in messaging in the U.S., its shift in business priorities could also indicate a larger change in the industry itself. Is the future of messaging in the U.S. not actually messaging at all? The Discover tab has been in the works for a long time, but it’s launching at the perfect time as Snapchat’s growth appears to have flatlined. Comscore numbers can be inaccurate on a point-by-point basis (most media organizations report bigger traffic numbers than Comscore has for them), but in terms of more macro growth trends they’re more reliable. 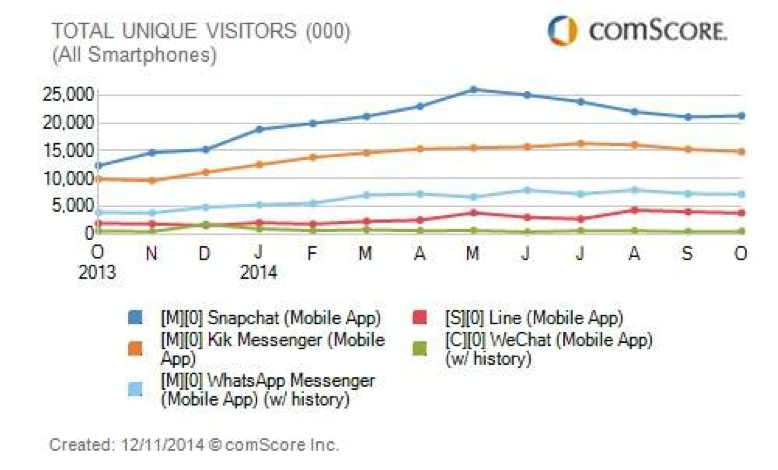 The analytics company found that messaging apps across the board, from Kik to WeChat to Snapchat, have stagnated. It was looking only at the 18+ crowd, and messaging users skew decidedly younger. But given the fact that Snapchat in particular has saturated the youth audience, its growth should be coming from the 18+ set. It’s fitting timing, then, for Snapchat to branch out like this. The app seemed to be distancing itself from its former core product in its Discover intro text for users. One Snapchat explanation screen said, “This is not social media. Discover isn’t about what’s most popular. We count on editors and artists, not clicks and shares, to determine what’s important.” In other words, this isn’t about messaging or virality. It’s not about newsfeeds or friends. It’s about something rather old-fashioned: Editorial judgment. Furthermore, the brands in the Discover section aren’t all young and hip. Sure, there’s the Vice and Cosmo of the lot. But there’s also CNN and Yahoo News. These traditional organizations lend a mature air to what is otherwise a very fresh, youthful experience. Perhaps Snapchat is hoping to give its older users something more to look at. Left: A screen from Discover’s People section; Middle: From Discover’s Food Network section; Right: From the Daily Mail. It’s no surprise that Snapchat thinks it will make more money off media than it could off messaging. Facebook discovered the same thing after a few years of running its newsfeed product. People stuck around and spent more time on the site when they had more content to look at than just baby pictures and wedding albums. That in turn made advertisers willing to pay more for the eyeballs. Snapchat wants media content to have the same effect on its audience, but it’s taking a very different approach. As it emphasized in its intro text mentioned above, this isn’t about “most popular” it’s about “what’s important.” The unwashed masses will not decide that ice bucket challenges will rise to the top. Media editors and Snapchat employees will. Facebook, Twitter, and Pinterest have a new, very different sort of competitor in the media-carrot-to-engage-users game. Snapchat’s initial partners were thrilled to tell the world they were picked first for the Discover tab. I received multiple pitches this morning from companies like CNN and Fusion heralding exactly that. Fusion wasn’t included in the initial launch of the 11, so it’s a sign that more media brands (like MTV) may be coming. Aside from tapping Snapchat’s huge base of users and turning them into viewers, it also gives them the caché of being on the cutting edge. But as always, media companies walk a dangerous tightrope in partnering with a tech application. As Mathew Ingram has written about many times, tech platforms’ interests haven’t aligned with media companies in the past. Although Facebook might have given big traffic boosts to organizations like Upworthy or Buzzfeed, it’s a tenuous agreement in the long term. The traffic a tech company giveth, it can easily taketh away with a tweak of an algorithm. Snapchat is making its own risky bet. It’s hoping it can become a money-making platform by becoming a media source, even if that means making messaging less of a priority. It’s a big shift for the company’s brand, image and functionality. Let’s see if it works.